I have a confession to make. I am a Japanese sewing books addict. I am also a fabric hoarder, but embarrassingly my collection of Japanese sewing books gives my fabric stash a run for its money. Luckily, there are good used bookshops here in Tokyo, so buying books isn't as bad for the bank as it could be. At least, that's what I keep telling myself, ha ha ha. My friend once commented that if you make at least 3 items from a book, you're getting your money's worth. And if you consider that the average price of a new Japanese sewing book is around ¥1,200, I would say 3 garments is a pretty good deal. Especially if you buy them used. Or better yet, if you borrow them from your local library! Hurray for tracing patterns. One of my favorite books was one that I came across after seeing my friend Gretchen's beautiful website, SORAbento. She has a shop where she sells her lovely bento (lunch) bags as seen above. Gretchen makes the most gorgeous clothing for her children, too, which is where I first saw the patterns for Minowa Mayumi's patterns come to life. I quickly searched out the book, the title of which translates roughly as "Girls clothes that I want to make", and, in the case of this book, I actually do want to make EVERYTHING. I think Minowa has quite a following here in Japan, and she has her own blog and website where she sells garments (both sites are in Japanese). She started sewing because her daughter was slimmer than the "average" size, and then began selling handmade items in 2008. Her style is simple and clean, and the clothes are meant to embody the joys of childhood. You can see this in the photos she uses to showcase her clothes and in the beautiful fabrics she chooses to model her looks. No extra frills; they are simply elegant and charming. One of the first garments I made from the book was the one pictured on the cover, the Yoke Dress. 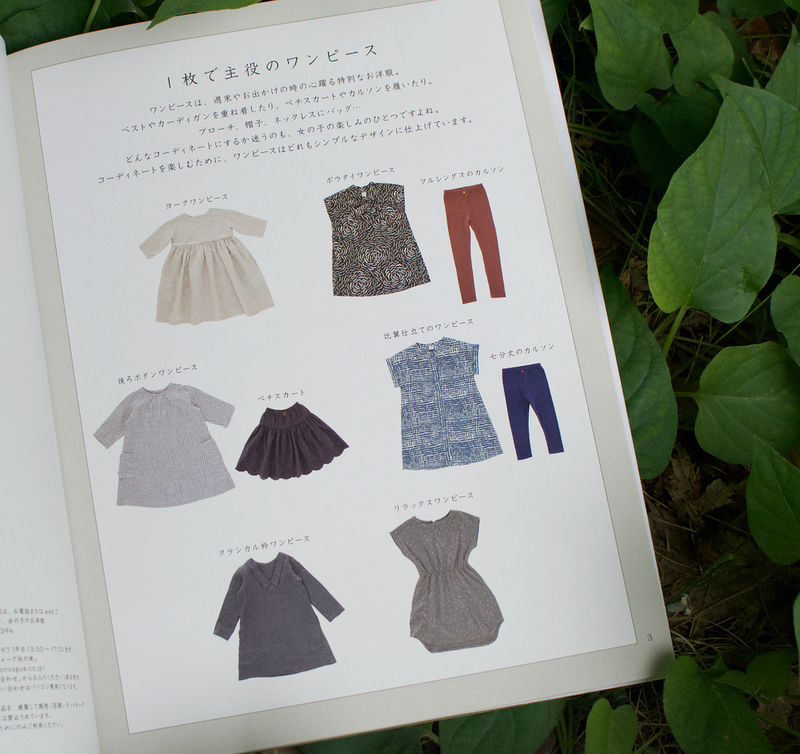 As it is the first item in the book, as with many Japanese sewing books, the instructions for the dress are quite detailed and accompanied with photographs rather than illustrations. Another thing I like about this book is that Minowa tells you the fabrics that she used and where you can purchase them (the info is in the back of the book). I believe I made the size 110cm dress for my then 4-year-old, and it was quite roomy on her, but that is the look. At 5 years old, I would say it now fits her perfectly. I remember one of the interesting aspects of this dress was how the pockets were constructed so that the seams were on the inside. This way, if you look at the pockets, they look very clean from the inside of the dress. Rebel that I am, I believe I did not follow these instructions. Sorry, Minowa-san!! The very first item I made from the book (before I really knew what I was doing) was the Cache-Coeur Blouse on p. 24 of the book. I loved the criss-cross look and the fact that lace was involved. I used a very pretty Kiki Parfait fabric, which I'd bought from Miss Matatabi for the express purpose (since I didn't even have a stash back then -- can you believe it?!) and some too-wide lace I'd bought in Nippori Fabric Town, and got to work. The illustrations are really clear and helpful, and quite detailed, unlike some other Japanese sewing books that I own. I began by sewing with Japanese patterns, so act of tracing and adding the seam allowance was not a dealbreaker. The blouse turned out a bit busier than I was expecting (I don't know why I was surprised, given the fabric), but I still like it a lot. My daughter insisted on modeling it even though it is now too small for her. I should have gone with lace of the recommended width rather than just "making do" with the wider lace. But at least this way it still sort of covers her tummy if she hikes up her pants, lol (tummy coverage is not up for discussion, apparently). Recently, I made the Tuck French Blouse (pictured on p. 22), first in a practice pink neon polka dot cotton, and then again in a Liberty fabric. This is a straightforward top with lovely pleats, but for some reason I recall having a bit of trouble with the facing. I think I had a hard time getting it to stay down even though I understitched it. Might be a good idea to stitch in the ditch at the shoulder seams next time. To go with the blouse, I made the Two Tuck Pants (with cuffs) in a cotton twill that I bought from my local Yuzawaya. The pants are roomy enough that you don't need any stretch, and I made them one size larger so she could wear them well into the autumn/winter, as we're well into the hot summer here. I thought the construction of the back pockets (would these be considered in-seam??) was quite interesting, and though I didn't quite get it perfect, it was something new to me. I left off the belt loops, as my daughter is not into wearing belts and it was just an extra step for me (see how lazy I am!). I like how baggy they are, and the cuffs are a cute touch. Let's not focus on the fact that I may or may not have sewn the pleats the wrong way. Ahem. She wore her new outfit to go for a fancy haircut. In the past, I have cut my daughters' hair, but it often ended in disaster with comments from my husband about how they will hold it against me when they see their pictures later in life. So this time I thought we would splurge and go to one of those fancy children's haircut places in Tokyo, where the kids sit in cars to get their hair cut. As an aside, did you know that some parents in Japan save their children's hair and have it made into a keepsake? My parents didn't do it, but I saw at the shop that they offer such services. You can have it made into a "pen" or a pendant. I was a bit worried my daughter would be a bit too old for the experience, but it turns out that she had a ball. Who wouldn't want to sit in a race car and watch TV while someone attends to you? Ha! Not something that we can do on a regular basis, but definitely a fun treat! Next on my list is the Relaxed Dress for my younger daughter, as she is a big fan of knits. The Japanese aesthetic isn't so much about twirly dresses, but I think this one is cute enough that she will agree to wear it. And for the autumn, I am eyeing the Robe Cardigan and the No-Collar Coat for their wardrobe. Have I convinced you to get this book yet? You should -- and join Mie in her fabulous series, Sew Japan with Mie! !